So, fall is officially here — a season I didn’t use to be very fond of. Not because of the season itself, but rather because fall meant that winter was coming. Grr…winter. When I moved to Chicago (over eight years ago), I started to appreciate fall. The smell of wood-burning smoke coming from the fireplace of an old brick home. The feeling of a hot cup of fresh-brewed coffee in my hands at my favorite local coffee shop. The crunch of colorful fall leaves under my leather boot-clad feet. The coziness of my favorite spot on the couch as I curl up for an afternoon of Bears football. These cookies will keep you warm during fall and beyond. 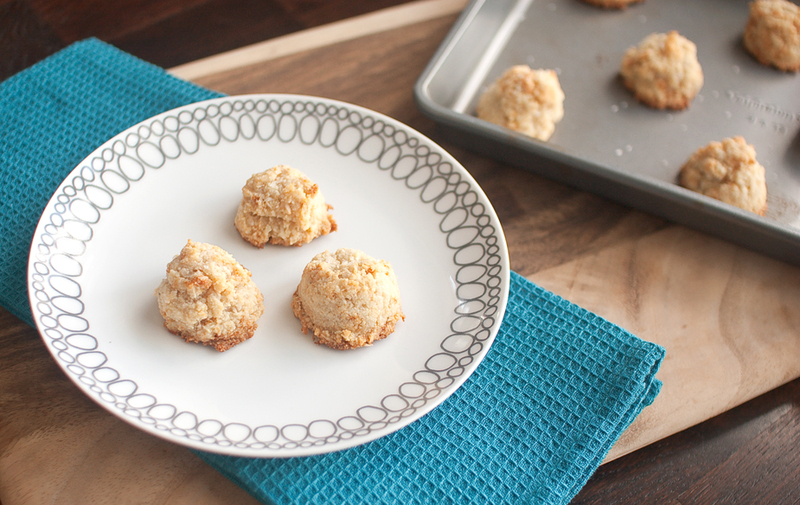 I’ve deemed them “weeknight cookies,” although you could certainly eat them any time. The reason I’ve given that name is because not only are they really easy to make, but they’re also dairy, refined grain and sugar-free. I’m not vegan or paleo by any means, but during the week I like to eat as cleanly as possible. That way, on the weekend, I can totally go overboard (which I usually do) and not feel guilty about it (or as guilty, anyway). In a small bowl, combine the almond flour, salt and baking soda. In a separate small bowl, combine the melted coconut oil, honey, coconut milk and vanilla extract. Mix the wet ingredients with the dry, stirring well to combine. Fold in the coconut flakes. Using a tablespoon measure, scoop batter onto a Silpat-lined cookie sheet (they don’t spread out that much, so it’s OK if they’re close together). Top with a sprinkle of sea salt, then transfer to the oven to bake for 12 minutes. Once removing the cookies from the oven, let cool on the cookie sheet for a few minutes before transferring to a wire rack. Cookies will be soft at first but will firm up after a few minutes on the cookie sheet, making them easier to transfer. Simple recipe – definitely another reason this would classify as a “weeknight” cookie. Question: can I substitute almond milk for the coconut milk in this recipe? Yes, you absolutely can. I’ve done it before and it works perfectly. I hear you, I’ve not been fair to the season either reproaching it for the upcoming winter but it has it’s own charms.